City Hall will be closed April 18. THE COUNCIL ADOPTED A NEW ORDINANCE REGARDING THE SELL OF CEREAL MALT BEVERAGES AND BEER NOT TO EXCEED 6% ALCOHOL BY VOLUME. IT WILL BE PLACED ON THE FEATURES PAGE AFTER IT HAS BEEN PUBLISHED IN THE FORT SCOTT TRIBUNE. Beginning July 1, 2019, we will be able to accept debit/credit cards for payments of utilities, court fines/fees, and miscellaneous fees, licenses and permits. Payments may be made online at govpaynow.com (pay location code a001te for utilities, code a001ud for court fines/fees, and code a001td for misc permits/license fees), by phone, or in person at City Hall. A link on this page is coming soon. Call or stop by City Hall for more information. There has been some inquiry about “pit bull” dogs in town. The City still has an ordinance banning “pit bull” breeds and mixes. We would also like to remind citizens that each household is only allowed three dogs and three cats six months of age or older. We would like to remind owners of go-karts to not drive them on city streets as they can’t be seen by drivers of other vehicles. 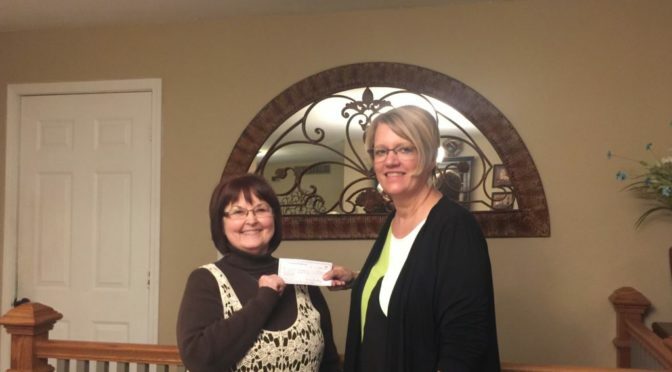 Joyce Davenport, right, President of Progressive Mothers Club of Fort Scott, presenting $200 to Janet Tucker for Bags of Love ministry on April 4. Submitted photo. The local Fort Scott Progressive Mothers’ Club has been very active through the years, according to Shirley Palmer a member. 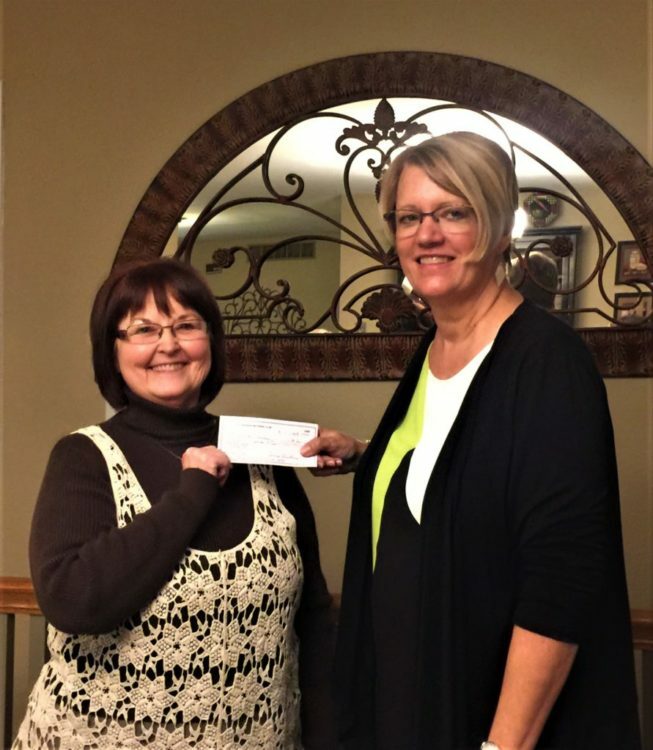 The local group recently presented Janet Tucker with a check for $200 to help with the project which helps children. Locally, the group program is called It’s My Very Own, Bags of Love. “When a child is removed from their home for reasons out of their control, a bag is filled with gender and age-appropriate items,” which is then given to the child, Tucker said. When a child is removed from their home by the local protective service, often they can take nothing with them but the clothes on their back. It’s My Very Own, is dedicated to providing a bag with personal care age and gender appropriate items for children from birth to 17 years old. 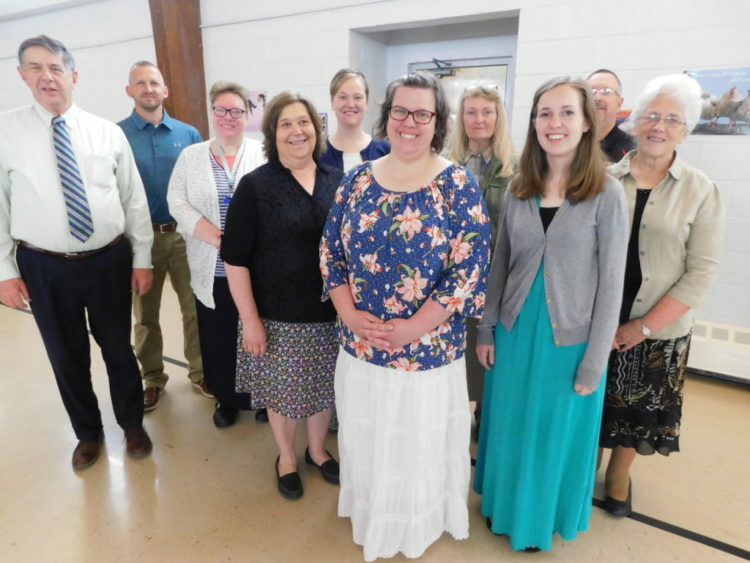 “These consist of basic body care items, stuffed animals, new toys, clothes, socks, p.j.’s, books, journals, diapers, baby care items, and then packed with lots of love and prayers,” Tucker said. Items currently needed: large/small stuffed animals (can be gently used), new toys, puzzles, coloring books/crayons, journals, pens, craft kits, shampoo/body wash, toothpaste/toothbrush, deodorant, combs/brushes, hair bows, and seasonal items, according to information provided. The supply list for duffle bags/comforters is colorful cotton/poly fabric, thread, twin flat sheets, high loft batting, thick cording, 1-inch buttons. Needed items for children “aging out” of foster care: laundry detergent and basket, Clorox wipes, paper towels, all-purpose cleaners, dish soap/sponge, stain remover, dryer sheets, trash bags, tampons/pads, body wash/soap, deodorant, shampoo/conditioner, towels/washcloths, small first aid kit, small lock box to keep important papers in, basic tool set, flashlight, batteries, planner for them to keep track of appointments, school supplies, blankets, basic cooking supplies, Walmart Gift Cards in increments of $25. Also needed are prayers, monetary gifts and ink and paper for printing, stamps, blade replacements, sewing pins/needles, and volunteers. 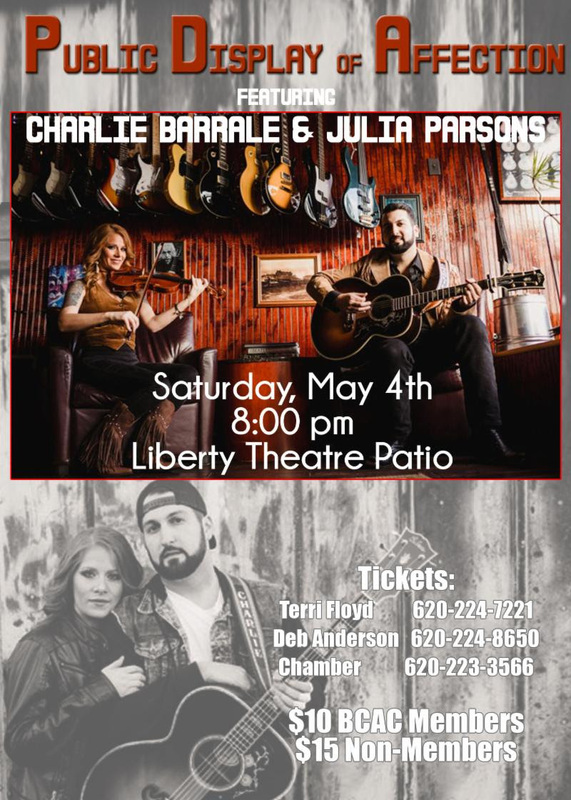 For more information contact Tucker at 620-768-9356. “The local Progressive Mothers’ Club meets monthly, September-April, with the purpose of helping and promoting children and their activities. The local group had a yearly membership of 24 people for many years and there used to be a waiting list for ladies in the community wanting to join. They met in homes for many years. Today their membership is eighteen and they often still meet in homes of members or in a place in the community. Through the years the local group has participated often in the Christmas Parades, Good ‘Ol Days parades, always promoting children. Their objective is to promote and to help children. They have helped with the Mother to Mother ministry by donating items many times. They give money to each of the schools for needed items for children throughout the school years. They often donate to families with children who have experienced house fires and who have lost everything. They adopt children of various ages at Christmas time and provide special Christmas gifts to them. All in all, this club is a very caring and giving organization. The Progressive Mothers’ Club was founded in March 1918 in Dayton, Ohio. The purpose of the club was to bring together local mothers for social and educational functions that were meant to nurture and enhance their role as mothers. The Progressive Mothers sought to provide opportunities for mothers to learn about child development, nurturing family environments, and the stresses associated with youth and families. The non-profit group prided itself on providing welfare and advocacy for all children. The Progressive Mothers’ Club joined the Federation of Women’s Clubs in 1921, as well as later joining the National Federation of Women’s Clubs. The official Progressive Mothers’ Club on the national level disbanded in 2003 but many Progressive Mothers’ alumni are still active and functioning in local clubs such as the Fort Scott group. 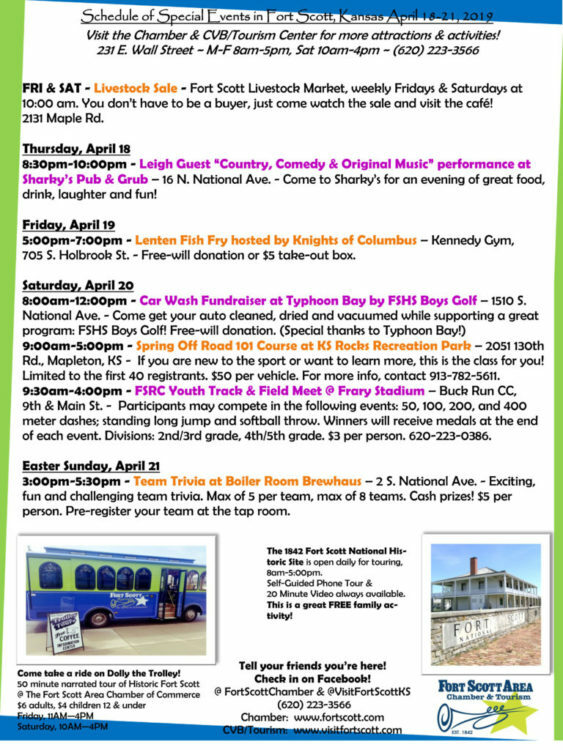 For more information about the club: contact Shirley Palmer at 620-223-4105. Ronni and Dane Clayton are the new owners of Union Station, Uniontown. Union Station, in the small town of Uniontown, population 267, has new owners. 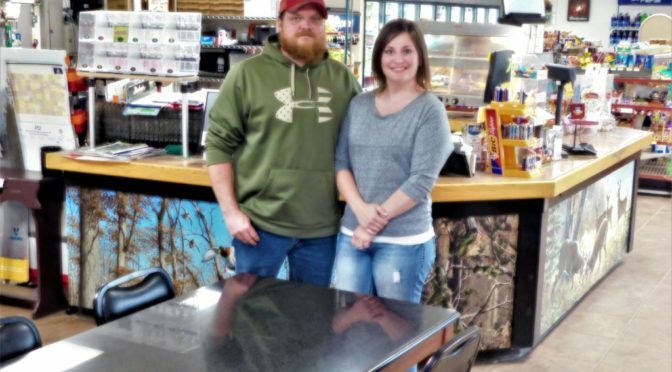 The station has been the gathering place/gas station/convenience store in Uniontown for about 20 years, under the ownership of Susan and Ron Eldridge. 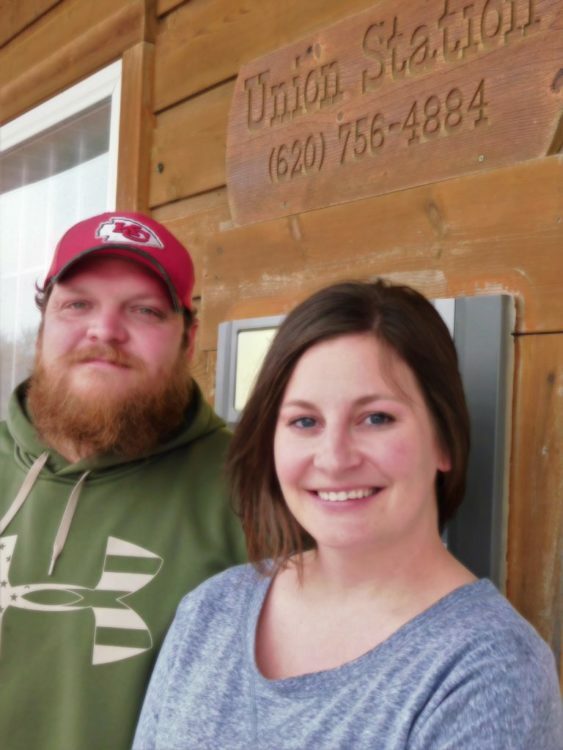 Ronni, 32, and Dane, 33, Clayton of rural western Bourbon County, purchased Union Station from the Eldridges, on April 1, 2019. “It seemed like it would be a good investment for the community and our girls, ages 6 and 4,” Ronni said. Both are graduates of Uniontown High School, Ronni in 2005 and Dane in 2004, and had attended school with the Eldridge’s daughters. The best thing for the Clayton’s so far is the community, Dane said. The Claytons have no current plans to change the business. “If it ain’t broke, don’t fix it,” Ronni said. The phone number remains 620-756-4884. The summer hours have taken effect and are 5 a.m. to 8 p.m. Monday through Friday, from 6 a.m. to 8 p.m. on Saturday and 7 a.m. to 3 p.m. on Sunday. Both continue to work other jobs and fill in shifts when needed at Union Station. Ronni works for the Farm Service Agency in Fort Scott. The two were working a shift Saturday evening so some employees could attend the Uniontown High School prom, just down the road. Other employees are Schotze Griffiths, manager; Christy Pritchett, Tammy Davidson, Nicole Clayton, Candace Clayton, Danea Esslinger, and additional high school students. The Bourbon County Commission met in open session with all three Commissioners, the County Counselor and the County Clerk present. Nancy Van Etten was present for a portion of the meeting. Jody Hoener met with the Commissioners to give a wellness update; she said that Bobby Reed (jail employee) is a new Wellness committee member. She said she will be asking the Commissioners to pass a policy to work towards implementing a tobacco free worksite (including chewing, vaping and smoking) for Bourbon County employees beginning 01/01/2020. She said it is important to make sure employees have the resources if they want to quit; Bourbon County health insurance requires a prescription for nicotine replacement therapies, Jody said she will work with C.H.C. to make the replacement therapies available. Jody reported that there are almost 50 business retention surveys completed. Jeff made a motion to go into a 10 minute executive session for personnel matters of individual non-elected personnel, Nick seconded and all approved, (the session included the Commissioners and Jim Harris). No action was taken. 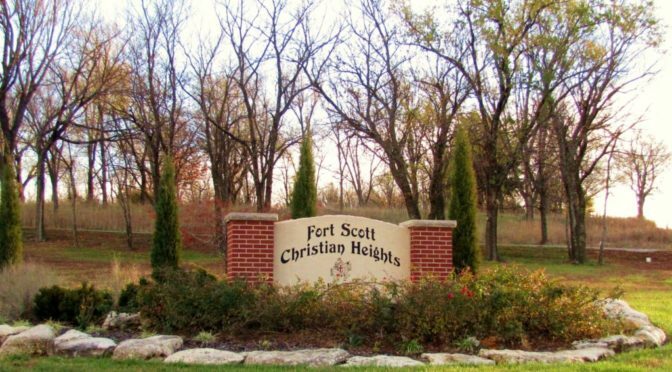 Jim Harris reported they are trimming trees for the City of Fort Scott this morning, he said they did this without the County Commissioners approval. Jim said he will want the City of Fort Scott’s asphalt trucks in return when the County needs them. Jeff suggested formalizing a mutual aid agreement. Lynne reported that Loretta George had reported potholes on Maple Road towards the tower as well as potholes on Hackberry Road west of the Airport. Jim Harris reported they had patched in the Industrial Park. Nick asked that Jim place rock larger than road rock on Unique east of the quarry; he said semis are getting stuck in the road there. Jim Harris discussed Hickory Road; the City of Fort Scott received a grant to build turning lanes into the LaRoche ballpark complex. The City has never asked the County to accept the road; Lynne said it is a City road unless it is turned over to the County. Jim Harris said they could use a milling machine to use around the County. Tammy Helm with the Fort Scott Tribune arrived at the meeting. The Commissioners will take bids in 2019 for the mow able hay at the old landfill as well as Elm Creek. Nick asked Jim to check with Big Sugar regarding the price for fish food. The Commissioners and Shane Walker discussed a list of incomplete items at the new jail; the Commissioners had compiled a list of items, Lynne received a list of incomplete items from Bill Martin and said he would compile the lists together. Jeff gave Lynne permission to send to the Commissioners a final list, the Commissioners to respond to his list as well as permission to draft a letter to Universal Construction and Goldberg Group with a 90 day deadline to complete the projects, Nick seconded and all approved. Lynne said he would call Universal to schedule doing the balancing at the jail as well as getting filter work completed. There was a discussion over needing a permanent ladder installed at the jail to use for maintenance on the roof top units; Shane said he will check into the cost of a ladder. Jeff made a motion to purchase and install a whole building water filter at the jail, Nick seconded and all approved. Tom Headley reported potholes in Devon; Lynne said he would discuss this with Jim Harris. Shane Walker reported they will need computers, printers and scanners at the new ambulance barn, he estimated this to cost $4,000; the Commissioners said this expense will come out the Ambulance fund. Terry Sercer met with the Commissioners; he planned a 2019 budget amendment in order to allow for the ambulance revenue and expenses. Lynne moved to approve publishing the amendment, Nick seconded and all approved. The budget amendment for the ambulance fund will be on April 16th at 10:00 am. Terry will publish the notice of the amendment. Terry estimated that the ambulance receipts will cover 70% of the ambulance expenses. The amended ambulance budget will allow for $1,020,000 in expenses and planned revenue of $1,036,020. Terry said he was pleased to tell the Commissioners that the budgeted 2018 carryover was $280,000 but Terry estimated the carryover to be approximately $500,000; Terry suggested (and the Commissioners agreed) that this excess be left in the General fund to be used for Ambulance expenses in 2019. Terry said if the money was used for ambulance expenses, the ambulance could replenish the fund with ambulance reimbursements. The Commissioners said the ambulance fund will likely always have to be subsidized. Terry said that some funds have a 2018 cash carryover; Terry will transfer the excess into reserve accounts for the following departments, Election equipment fund will have approximately $28,000 transferred and the Appraiser fund will have approximately $6,000 transferred into the Appraiser reserve fund. Any excess in the Road & Bridge Sales Tax will stay in that fund. 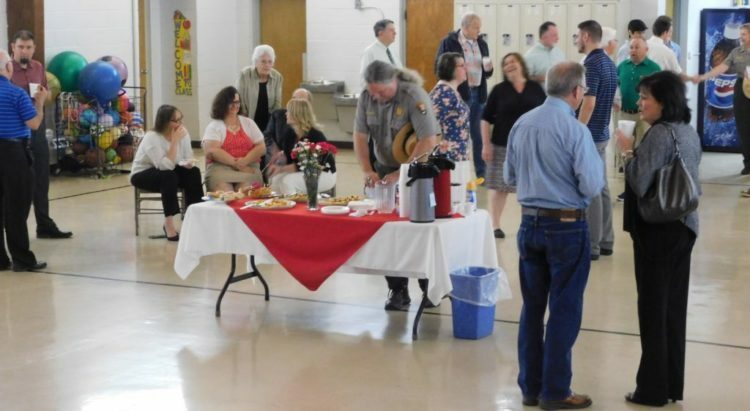 City of Fort Scott employees Larry Gazaway, Rachel Pruitt, Rhonda Dunn, Dave Martin as well as City Commissioner Cheryl Adamson met with the Commissioners, Jim Harris, Jerad Heckman and Jody Hoener. Justin Meeks said this was not on the agenda, but said they came to discuss the cooperation between the County and the City of Fort Scott. Larry Gazaway gave a tourism update; he said approximately $24 million is spent annually by visitors; he said they receive an average of 1,000 people a month at the tourism center. Larry described Geofence, an advertising option being used. Larry discussed past and future conferences to be held in Fort Scott. Larry asked for funding from Bourbon County (approximately $15,000 annually) to help pay for advertising and marketing expenses. Lynne said the County will begin working on the 2020 budget in June and could consider this request to help with economic development. Larry said his current budget is funded by Transient Guest Tax; he said the City charges 6% for Transient Guest Tax for overnight (not extended stay rentals) rentals and hotels. Justin suggested that there is lodging in the northwest part of the County that could be a part of the Transient Guest Tax. There was a brief discussion over the 1 cent sales tax; this sales tax was voted on and is used for road maintenance. 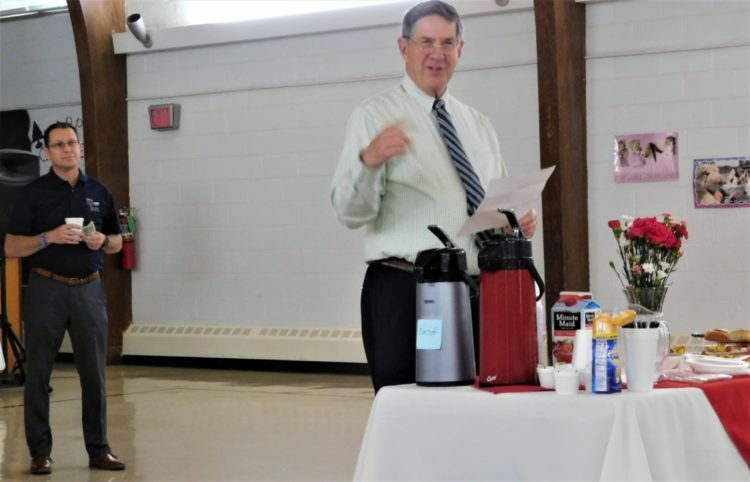 The County and the Cities in the County share this money; this will be voted on again in the future, Dave Martin suggested that the County and City partner to get the word out so that the public sees the importance of the sales tax. Lynne said he will meet with Robert Uhler regarding this tax. Justin suggested that at some point all of the Cities and the County need to get together regarding this tax. Rhonda Dunn said the City wanted to withdraw their request for the County to waive the Landfill fees for the debris from the demolishing of the Stout building; she said it was not their intention to create turmoil. Lynne made a motion to rescind the decision for Bourbon County to waive the Landfill fees for the debris from the demolishing of the Stout building, Jeff seconded and all approved. Lynne made a motion to go into a 15 minute executive session for consultation with an attorney for the body or agency which would be deemed privileged in the attorney-client relationship, Nick seconded and all approved, (the session included the Commissioners and Justin Meeks). No action was taken. Justin Meeks reported that he recently received a request to take over dockets; he said he had did this. Nick made a motion that Justin constructs a HIPPA release concerning Dave Bruner, Jeff seconded and all approved. Nick made a motion to give Lynne, Justin Meeks, Jim Harris and Shane Walker permission to attend a meeting with Senator Watkins regarding a confidential proposal, Jeff seconded and all approved. Jeff made a motion to break for lunch and reconvene at 1:30, Lynne seconded and all approved. Christy Keating, Dave Bruner and Robert Uhler met with the Commissioners to discuss the ambulance service; Amanda Gilmore was also present for this meeting. Christy said that in March there were 218 requests for service; 164 transports, 94 to facilities, 67 to Via Christi Fort Scott, 3 medical transports and 54 dry runs. Christy said they are now at full staff for the ambulance. Christy said they had received calls from citizens who were concerned about the delay in transfers (on a busy day); she said they had to prioritize the patient’s needs on the order of the transfers. Dave Bruner said they will get one new ambulance in service now, he said they need minimal supplies for the 2nd ambulance to get it in service. Dave said they get fuel for the ambulances at the City unless they are out of town and need fuel. The Commissioners commended everyone for the work regarding the ambulance service. The ambulance barn is nearly complete; Lynne suggested spending the money to get the ambulance building thoroughly insulated. The Commissioners met with Jim Harris; Lynne reported that Robert Uhler with the City of Fort Scott asked for the price for 14,000 ton of asphalt without chips. Jim estimated it to cost $45-$60/ton at the plant based on 2018 expenses. Justin said he would review the Attorney General’s opinion on this. Nick made a motion to go into a 15 minute executive session regarding consultation with an attorney for the body or agency which would be deemed privileged in the attorney-client relationship, Jeff seconded and all approved, (the session included the Commissioners, Justin Meeks and Jim Harris). No action was taken. The Commissioners agreed that if any department wants to plant flowers/plants in the flower beds at the Courthouse they could spend up to $100 for the cost of the flowers/plants. Lynne made a motion that he signs a KWORCC loss prevention report, Nick seconded and all approved. At 3:38, Lynne made a motion to adjourn, Nick seconded and all approved. April 23. 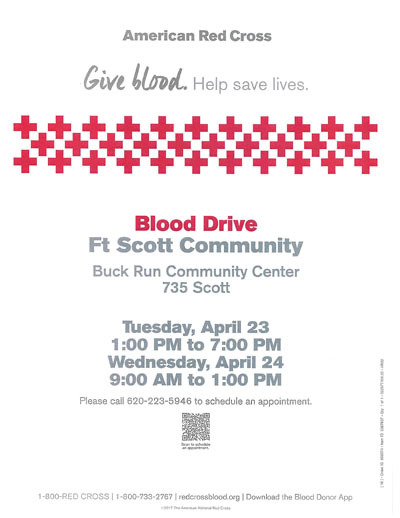 Bloodmobile will be at Buck Run Community Center from 1 – 7 pm. Blood donation is a national Legion program. Call 620-223-5946 to schedule an appointment. April 24. Bloodmobile will be at Buck Run Community Center from 9 am – 1 pm. Blood donation is a national Legion program. Call 620-223-5946 to schedule an appointment. April 27. Women’s Self-Defense class from 10 am – 12 pm at Fort Scott Middle School. Signup online at takedefense.org or by calling 620-223-1440. Ages 12 – 90. No males allowed. May 1. Post 25 will greet the 2nd Annual Warrior Convoy through Fort Scott at 1:30 pm. Come join other Post 25 members and their families and friends at Memorial Hall as we welcome these combat Warriors to Fort Scott. May 6. Post 25 meet and greet at 6:30 pm in Memorial Hall. Come and enjoy the fellowship of other Veterans. Bring an eligible Veteran to visit our Post. May 6. Post 25 general membership meeting at 7 pm in Memorial Hall. Our membership meetings are open to all. SAL members are strongly encouraged to attend. Tonight’s meeting will include the installation of Post Officers for the 2019 – 20 Legion year. 2nd District Commander Marri Krupco will conduct the installation. May 17-19. Department of Kansas American Legion Convention. Hutchinson, Ks. Any paid 2019 Legionnaire can attend. Post 25 can have four delegates at the Convention. Post 25 is authorized four voting delegates. Two more delegates are needed. Contact Post Commander Carl Jowers if you would like to attend and represent Post 25. May 31 – June 2. American Legion Leadership College at Cloud County Community College, Concordia, Ks. Any paid 2019 Legionnaire can attend. Contact Post Commander Carl Jowers for more information on attending. April 15. Fort Scott/Topeka VA Medical Center shuttle departs Pete’s Convenience Store, 1920 South Main Street, parking lot. Vets needing a ride for a medical appointment must call 785-925-0261 to schedule a seat. April 16. Fort Scott/Topeka VA Medical Center shuttle departs Pete’s Convenience Store, 1920 South Main Street, parking lot. Vets needing a ride for a medical appointment must call 785-925-0261 to schedule a seat. April 17. Fort Scott/Kansas City VA Medical Center shuttle departs Pete’s Convenience Store, 1920 South Main Street, parking lot. Vets needing a ride for a medical appointment must call 785-925-0261 to schedule a seat. April 22. Fort Scott/Topeka VA Medical Center shuttle departs Pete’s Convenience Store, 1920 South Main Street, parking lot. Vets needing a ride for a medical appointment must call 785-925-0261 to schedule a seat. April 23. Fort Scott/Topeka VA Medical Center shuttle departs Pete’s Convenience Store, 1920 South Main Street, parking lot. Vets needing a ride for a medical appointment must call 785-925-0261 to schedule a seat. April 24. Fort Scott/Kansas City VA Medical Center shuttle departs Pete’s Convenience Store, 1920 South Main Street, parking lot. Vets needing a ride for a medical appointment must call 785-925-0261 to schedule a seat. April 29. Fort Scott/Topeka VA Medical Center shuttle departs Pete’s Convenience Store, 1920 South Main Street, parking lot. Vets needing a ride for a medical appointment must call 785-925-0261 to schedule a seat. April 30. Fort Scott/Topeka VA Medical Center shuttle departs Pete’s Convenience Store, 1920 South Main Street, parking lot. Vets needing a ride for a medical appointment must call 785-925-0261 to schedule a seat. May 1. Fort Scott/Kansas City VA Medical Center shuttle departs Pete’s Convenience Store, 1920 South Main Street, parking lot. Vets needing a ride for a medical appointment must call 785-925-0261 to schedule a seat. May 6. Fort Scott/Topeka VA Medical Center shuttle departs Pete’s Convenience Store, 1920 South Main Street, parking lot. Vets needing a ride for a medical appointment must call 785-925-0261 to schedule a seat. May 7. Fort Scott/Topeka VA Medical Center shuttle departs Pete’s Convenience Store, 1920 South Main Street, parking lot. Vets needing a ride for a medical appointment must call 785-925-0261 to schedule a seat. May 8. Fort Scott/Kansas City VA Medical Center shuttle departs Pete’s Convenience Store, 1920 South Main Street, parking lot. Vets needing a ride for a medical appointment must call 785-925-0261 to schedule a seat. Remember to check out Post 25 on Facebook. It contains current information pertaining to Veterans and their families. Fort Scott American Legion Thompson-Harkey Post 25 continues to lead the Department of Kansas in membership at 151% with 77 members. Recruit a new Legion member and both you and the new member will be entered into a drawing where each of you could win $500. This new member contest runs until May. Bringing in a past member whose membership expired in 2017 or earlier would also count towards the $500 drawing. If you need recruiting brochures or membership applications, please contact me. I’ll make arrangements to deliver them to you. Post Service Officer Myra Jowers will meet with anyone, by appointment, who has questions about filing VA claims, who need a second set of eyes to review their claims or help understand VA documents they have received in the mail. Her service is free and is for anyone, Veteran or family member, who wishes to file a claim or appeal a denied claim. She can be reached at myrajowers@ymail.com or 620.215.1286 to schedule an appointment. Fort Scott/Topeka VA Medical Center shuttle operates on Mondays and Tuesdays. Fort Scott/Kansas City VA Medical Center shuttle operates on Wednesdays. Any area Vet needing a ride for a medical appointment should call 785-925-0261 for more information or to reserve a seat. All Vets riding the shuttle must have medical appointments between 9 am and 1 pm on the day they ride the shuttle and call by 5 pm the day before their appointment to schedule their ride. Shuttle will depart from Pete’s 66 on Main Street and can stop at Pleasanton, Louisburg and Ottawa to pick up scheduled riders. The shuttle’s Fort Scott departure time is based upon the earliest scheduled appointment of a Rider. The shuttle coordinator will contact Riders with the departure time the evening before their scheduled ride. We are moving towards starting an American Legion Riders. An organizational meeting will be scheduled in early May. The date and time will be based upon ALR District Officers availability. If you are interested in joining the Post 25 Riders Chapter, contact Post Commander Carl Jowers to be placed on a meeting notification list. The requirements to join the ALR are on the attached flyer. Your Post 25 Color Guard continues to grow. Come to the May 9 meeting and learn more about the Post 25 Color Guard. Darrell Spencer serves as the Color Guard Captain. Legion merchandise can be ordered through Emblem Sales: https://emblem.legion.org/. Contact me if ordering a Legion cap to insure your cap has the correct lettering. Ralph Carlson is seeking volunteers to help with minor home repairs for low income area residents. Volunteers with carpentry, plumbing and electrical skills. All projects are short term and can be accomplished based upon the volunteer’s availability. Some of Ralph’s most recent projects were wheelchair ramps for two disabled Veterans and repairing a kitchen floor for a senior citizen. Call Ralph at 620-644-8162 to volunteer or more for information about his program. The Fort Scott Cancer Treatment Center relocated to Chanute. Drivers are needed to take Fort Scott patients to Chanute for chemotherapy. Drivers will use their own vehicle and there is a small stipend for gas, if requested. A driver will take the chemo patient to their appointment in Chanute and wait for treatment to be completed and then bring the patient back to Fort Scott. The driver may have only a half hour wait for the patient or two – three hours. Call Donna Bauer at 620-224-7075 for more information or to volunteer. You do not have to be a Veteran to step up for one of the volunteer opportunities. Just someone who will step up and offer a helping hand to our neighbors. 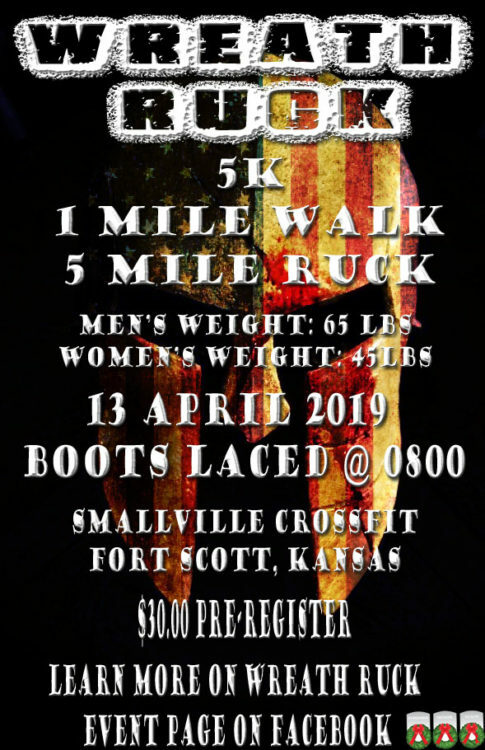 Please show up at Smallville Crossfit 30 minutes prior to the event. 1 Mile at 9:00 a.m.